Hatters striker Danny Hylton gave further evidence he is well and truly back to his best now with a starring role in Luton's victory over Newport County this afternoon. Not only did the Luton forward notch twice, once from the penalty spot, it was his all-round display that caught the eye, playing some outrageous reverse passes at time, and linking up impressively with both James Collins and Harry Cornick. It wasn't just Hylton either, Cornick once again produced another high octane performance as part of a front three, with finishing the only slight smudge on his copybook, as he blasted a number of efforts wide of the target when a cooler head would have surely led to his first goal. 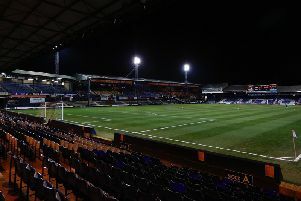 The hosts named an unchanged side from the 0-0 draw at Morecambe on Tuesday night, although Johnny Mullins and Elliot Lee were fit enough to return to the bench, with Newport arriving in Bedfordshire having never won at Kenilworth Road in their 30 previous visits, spanning over 100 years. Town looked to make the same kind of high tempo start they had managed against Morecambe in midweek, Hylton heading over the bar, while his teasing cross was punched away by Joe Day. It paid off this time too, as on 12 minutes, a free kick was awarded a good 40 yards out, Alan Sheehan sending the ball into the danger area and it appeared to miss everyone before nestling in the bottom corner for the Irishman's first goal of the season. Town looked for a second to really put the pressure on an in-form Newport side, Olly Lee finding Cornick in the box, who turned his man before shooting low, denied by the fingertips of Day. However, the keeper could do nothing on 22 minutes when Luton extended their advantage as Scott Cuthbert's ball forward was well taken by Collins, the forward reaching the byline and cutting back for Hylton to finish impudently. There was no chance of Luton attempting to declare there either, with Collins, Hylton and Cornick causing havoc to the visitors defence, the trio virtually unplayable at times. Although Cornick and Luke Gambin blazed well over, Town were then awarded a spotkick on 35 minutes when Glen Rea was adjudged to have been hauled back by Ben Tozer in the area. Hylton grabbed the ball and despite missing at Wycombe recently, held his nerve admirably this time to wait for Day to commit himself and then nervelessly dink the ball down the centre. The striker should have been lining up another effort from 12 yards moments later, after being clipped by the already booked Ben White, but there was nothing doing this time. Jack Stacey almost made it even better by the break, his low shot hitting the base of the post, cannoning off Day and going behind. Now with his confidence brimming, Hylton tried to complete his hat-trick in audacious fashion, his 30 yard chip not quite coming down in time, but Town left the field to a marvellous reception from the home fans who had been well and truly entertained by the wonderful 45 minutes they had witnessed. After the break, Town began well again, Cornick finding space but firing wide, while Collins saw yellow for what official Mark Heywood deemed as diving in the area. Out of nothing, Newport had one back on 56 minutes when for once, Town just couldn't clear their lines and despite Lee appearing to be pushed in the build-up, play was waved on, allowing Joss Labadie to tuck his shot through the legs of Marek Stech. Somehow Town went from a position of dominance to clinging on to their lead at times, as Mickey Demetriou was a whisker away from setting off the alarm bells, his shot scraping the post. Town had an opportunity to add a fourth, Cornick breaking with pace and finding Gambin, who cut inside David Pipe, only to see his effort blocked. Newport were now demonstrating just why Crawley chief Harry Kewell had labelled them a direct side after his team's 2-1 defeat recently, hammering ball after ball into the area with little thought, sending a whole host of long throws Luton's way too. However, Hatters led superbly by captain Scott Cuthbert yet again, repelled everything that came their way, with Stech mopping up whenever possible too, as Luton's back-line held firm, ensuring clear-cut chances were at a minimum. Cornick should really have added some breathing space, thundering over the top when well placed, but he continued to be Luton's go to man on the break once more, displaying boundless energy to get his team up the pitch. You got the sense that County's race was run, as having weathered the storm, Luton set about trying to make the margin of victory even more comfortable in the final 15 minutes. They almost managed it as well, Hylton firing into the side-netting, Lee hammering over, before James Justin had his first league minutes of the campaign, replacing Cornick, who rightly received a standing ovation. That switch saw Stacey pushed forward and he almost added a late gloss, picked out brilliantly by Hylton's dink, but Day was out quickly. Late on Sheehan's free kick was easy enough for the County stopper, as Town picked up yet another victory over their Welsh opponents on home soil. Hatters: Marek Stech, Jack Stacey, Dan Potts, Scott Cuthbert, Alan Sheehan, Glen Rea, Olly Lee, Luke Gambin (Jordan Cook 71), Harry Cornick (James Justin 85), Danny Hylton, James Collins. Subs not used: James Shea, Akin Famewo, Aaron Jarvis, Johnny Mullins, Elliot Lee. Exiles: Joe Day, David Pipe, Joss Labadie (C Shawn McCoulsky 78), Ben White, Robbie Willmott (Lamar Reynolds 71), Padraig Amond (Joe Quigley 76), Frank Nouble, Ben Tozer, Mark O'Brien, Sean Rigg, Mickey Demetriou. Subs not used: Dan Butler, Matty Dolan, Scot Bennett, James Bittner. Hatters MOM: Danny Hylton. Easily back to his best once more.